I needed a dress for a wedding. Not just any old wedding but a beautiful Indian wedding where I couldn’t hope to compete with the finery of silks and saris. No pressure, then! 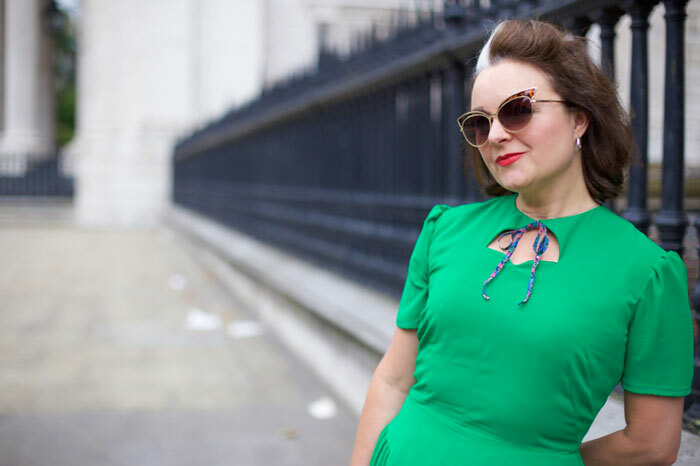 I rifled through every kind of fabric and bored all the Goldhawk Road shop owners senseless with my dilemma, during the weeks leading up to the big day. I diligently visited a roll of paisley brocade in A-One Fabrics, three days on the trot, properly umming and arrring out loud. But it wasn’t quite right. I ordered some gorgeous cotton satin roseprint from Minerva thinking … actually who knows what I was thinking. It was all wrong until I spied a roll of drapey green fabric at the back of the shop. 100% polyester it transpires. My inner snob rose to the fore but I bashed it back down when I handled the weight and the smooth silky texture and noted the lack of crease when I screwed it into a ball. And oh the colour! Not to mention the price tag of £4.00 a metre. I wasn’t arguing at all! I already had this pattern in mind: Blackmore 8194. It’s not dated but I’m guessing late 40s. 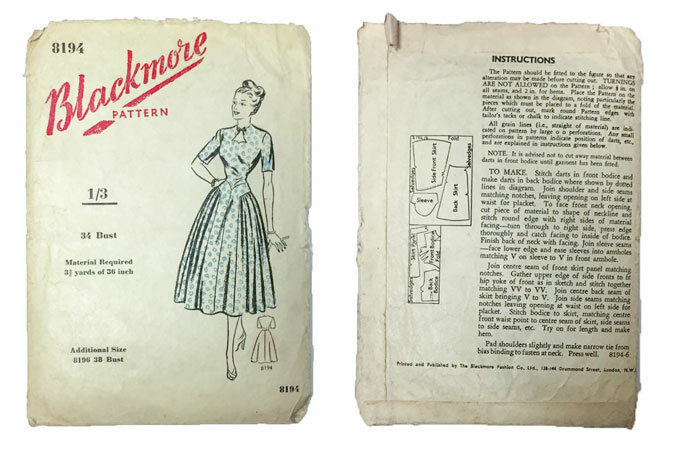 Vintage Patterns Wikia has it down as 1950s but also claims that Blackmore published paper patterns between 1845 and 1940, so that doesn’t add up! I was sold on the waist and hip detail, the softly gathered side fronts that fall from the hip and that cheeky little key hole detail with the bow tie feature. Incidentally the bow tie itself is some vintage liberty homemade bias binding that I inherited. I made a quick bodice toile in the original size, half knowing it was too small, but wanting to test the pattern without sleeves. Inevitably I changed my mind and graded the pattern up a size. Redrawing the pattern allowed me to add the seam allowance on too. Something this pattern didn’t allow for which also shows it’s age a bit, I think. 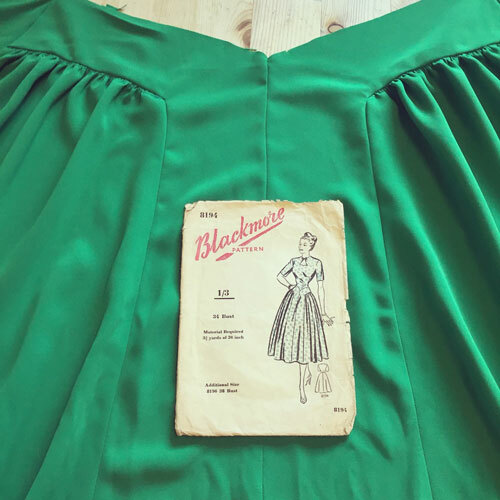 I’m quite used to vintage patterns without markings or seam allowances but one thing that struck me as a bit odd with this one, was an instruction to “Make darts in the back bodice where shown by dotted lines in diagram”. Quite literally the diagram which is the tiny pattern layout illustration on the back of the packet. So it’s anyone’s guess, really! Inserting the gathered panels into that front skirt panel was a bit tricky but quilting skills have taught me how to clip and pivot at a point, so it wasn’t too terrifying. Again, the instructions are loose: “Gather upper edge of side fronts to fit hip yoke of front as in sketch and stitch together matching VV to VV.” Simples, lol! I’m pretty pleased with the outcome. And it worked well for a wedding where colour was the order of the day. But there are niggles: I forgot to add seam allowance to the sleeves which actually doesn’t appear to make much difference but I did sew them on back to front! How much difference that makes will show in the next version which I’d like to make soon while it’s all fresh in my head; The waistline could do with a bit of ease. I like how it’s nipped in but it’s not that comfortable! And although the fabric is nice and drapey, I’d like to try it in a lawn or a lightweight cotton so that the neckline and the darts press sharper. I also neglected to do my usual adjustment to take out the excess fabric from the back bodice. I cheated instead by removing the zip and trimming the centre back seam… not very well! Considering I pretty much sewed this up the day before and was hemming on the morning of the wedding, I think it turned out pretty well. The niggles can so easily be sorted next time round. And to get change from a tenner is such the ‘Brucey bonus’ that I feel it prudent to reward myself with some lovely lawn! I don’t have any of the official pictures from the day to share as yet but I’m sure you can imagine how stunning all the ladies looked, as did the men in their exquisite flocked and braided coats. I can’t begin to tell you how gorgeous my friend the bride looked. But I did shed actual tears – in a good way – when she walked into the room. Such an honour to have been invited to such a special day. And I’m so glad I went to the bother of making a dress, especially. 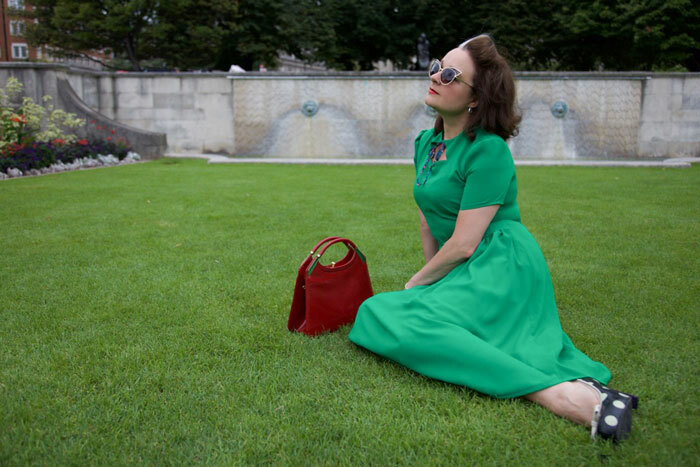 Photos by the wonderful Daniel Selway. What a colour, so beautiful. I love those hip gathers really flattering. Are many unmarked patterns without sa? Gosh that makes them even more fiddly! Beautiful! I am really looking forward to seeing the next iteration, too – it’s such a great pattern! Amazing dress! Gorgeous style lines and great color on you! What a stylish outfit! beautiful shoes too. Thanks Catherine. It needed heels for sure! This is stunning! The colour looks amazing on you and I love those angled gathers on the skirt fronts. Definitely forties with that detailing and neckline shape. I can see how it would be dated as early fifties because of the gathers, but inserting them into panels is oh so very forties-esque technique. And who can doubt those gathered sleeve caps?! Never trust wiki-anything! GREAT pattern and dress! Thanks for the confirmation, Erin. I thought so too but there is always info out there to cause doubt! Lovely colour and the neckline details. This is gorgeous!! I love the gathers at the hips, and the colour is fab. Good luck with the next one! That dress is very beautifull! I have used Blackmores patterns in the past, and they can be a bit vague; still have some frocks I made in the 70’s/80’s; will never fit in them again but can’t bear to part with them! Just stunning and so cute at the same time. Love everything about it!